Hundreds of iconic moai statues stand testament to the vibrant civilization that once inhabited Easter Island, but there are far fewer clues about why this civilization mysteriously vanished. Did they shortsightedly exhaust the island’s resources? Were they decimated by European illnesses and slave trade? Or did stow-away rats devastate the native ecosystem? Such theories have spread widely, but recent evidence shows that the truth is not as simple as any one of these alone. “These different interpretations may be complementary, rather than incompatible,” said Dr. Valentí Rull. “In the last decade, there’s been a burst in new studies, including additional research sites and novel techniques, which demand that we reconsider the climatic, ecological and cultural developments that occurred.” Rull is a senior researcher of the Spanish National Research Council in Barcelona, Spain, and the lead author of an overview on the holistic reassessment of Easter Island history. Until recently, the evidence has been limited. Prior sedimentary samples—commonly used as historical records of environmental change—were incomplete, with gaps and inconsistencies in the timeline. Furthermore, past interpretations relied heavily on pollen alone, without incorporating more faithful indicators of climate change. Due to this uncertainty, many fundamental questions remain, not only about why the culture disappeared, but also precisely when these events occurred and how this civilization developed in the first place. Using the latest analytical methods, Rull and his collaborators are beginning to shed light on many of these questions. Complete sedimentary samples now show a continuous record of the last 3000 years, showing how droughts and wet seasons may have influenced the island’s population. Sea travel depended on such weather patterns, resulting in periods of cultural exchange or isolation. Rainfall also impacted native palm forests, with droughts potentially contributing to the island’s eventual deforestation. Radiocarbon dating and DNA analysis of artifacts and human remains are also showing where the inhabitants lived on the island, what they farmed and ate, and the influence of cultures beyond their Polynesian ancestors. “These findings challenge classical collapse theories and the new picture shows a long and gradual process due to both ecological and cultural changes. In particular, the evidence suggests that there was not an island-wide abrupt ecological and cultural collapse before the European arrival in 1722,” said Rull. There is much work yet to be done before this mystery is solved, but it is clear that neither environmental nor human activities are solely responsible for the events on Easter Island. Only a combined approach that encompasses climate, ecology, and culture will fully explain how this ancient civilization went extinct. The article is published in the open-access journal Frontiers in Ecology and Evolution. PULLMAN, Wash. – The heavily studied yet largely unexplained disappearance of ancestral Pueblo people from southwest Colorado is “the most vexing and persistent question in Southwestern archaeology,” according to the New York Times. But it’s not all that unique, say Washington State University scientists. Writing in the journal Science Advances, they say the region saw three other cultural transitions over the preceding five centuries. The researchers also document recurring narratives in which the Pueblo people agreed on canons of ritual, behavior and belief that quickly dissolved as climate change hurt crops and precipitated social turmoil and violence. “The process of releasing one’s self from those canons, the process of breaking that down, can occur very quickly and occurred very quickly four times in the Pueblo past,” said Kyle Bocinsky, a WSU adjunct faculty member in anthropology and director of sponsored projects for the Crow Canyon Archaeological Center in Cortez, Colo. The article grew out of work toward Bocinsky’s WSU doctorate. Funded by the National Science Foundation, Bocinsky, WSU Regents Professor Tim Kohler and colleagues analyzed data from just over 1,000 southwest archaeological sites and nearly 30,000 tree-ring dates that served as indicators of rainfall, heat and time. Their data-intensive approach, facilitated by climate reconstructions run at the National Center for Supercomputing Applications at the University of Illinois at Urbana-Champaign, gives a remarkably detailed picture of year-to-year changes. This is particularly important as droughts of just five or ten years were enough to prompt major shifts in the small niches where Pueblo people grew maize, their major crop. The niches, said Kohler, were “woven together with a web of ceremony and ritual that required belief in the supernatural” to ensure plentiful rain and good crops. When rains failed to appear, he said, the rituals were delegitimized. “Then there’s a point where people say, ‘This isn’t working. We’re leaving,’” he said. That starts a period of exploration in which people look for new places to live and develop new ways of living, followed by a period of exploitation in a new niche with different behaviors and values. “There’s a new period of wealth creation, investment in architecture and culture change,” said Kohler. The researchers said the first period of exploitation, known as Basketmaker III, took place between 600 and 700 A.D. It ended with a mild drought and was followed by a period known as Pueblo I, in which the practice of storing maize in underground chambers gave way to storage in rooms above ground. The researchers think this represents a shift from unrestricted sharing of food to more restricted exchanges controlled by households or family groups. The period ended around 890 with a slightly larger drought. 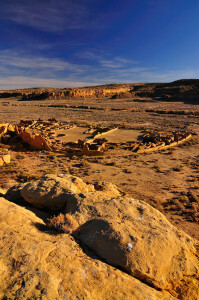 The exploitation phase of the Pueblo II period ran from 1035 to 1145 and was marked by large shared plazas and great houses—what we would today call McMansions—in the Chaco Canyon area south of Mesa Verde, Colo. Led by the University of Adelaide’s Australian Centre for Ancient DNA (ACAD), the researchers have reconstructed a genetic history of Indigenous American populations by looking directly into the DNA of 92 pre-Columbian mummies and skeletons, between 500 and 8600 years old. 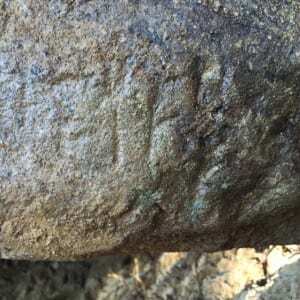 Archaeologists in Italy have discovered what may be a rare sacred text in the Etruscan language that is likely to yield rich details about Etruscan worship of a god or goddess. The lengthy text is inscribed on a large 6th century BCE sandstone slab that was uncovered from an Etruscan temple. A new religious artifact is rare. Most Etruscan discoveries typically have been grave and funeral objects. “This is probably going to be a sacred text, and will be remarkable for telling us about the early belief system of a lost culture that is fundamental to western traditions,” said archaeologist Gregory Warden, co-director and principal investigator of the Mugello Valley Archaeological Project, which made the discovery. The slab, weighing about 500 pounds and nearly four feet tall by more than two feet wide, has at least 70 legible letters and punctuation marks, said Warden, professor emeritus at Southern Methodist University, Dallas, main sponsor of the project. 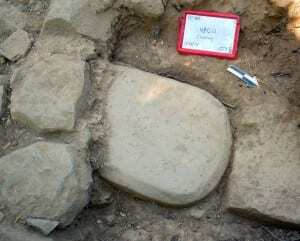 Scholars in the field predict the stele (STEE-lee), as such slabs are called, will yield a wealth of new knowledge about the lost culture of the Etruscans. The stele has at least 70 legible letters and punctuation marks, likely with new words never seen before. The Etruscan civilization once ruled Rome and influenced Romans on everything from religion to government to art to architecture. Considered one of the most religious people of the ancient world, Etruscan life was permeated by religion, and ruling magistrates also exercised religious authority. The slab was discovered embedded in the foundations of a monumental temple where it had been buried for more than 2,500 years. At one time it would have been displayed as an imposing and monumental symbol of authority, Warden said. The Mugello Valley dig, specifically the Poggio Colla site, is northeast of Florence, Italy. The slab would have been connected to the early sacred life of the sanctuary there. The architecture then was characterized by timber-framed oval structures pre-dating a large temple with an imposing stone podium and large stone column bases of the Tuscan Doric type, five of which have been found at the site, Warden said. Conservation and study of the stele, with full photogrammetry and laser scanning to document all aspects of the conservation process and all details of the inscribed surfaces, is underway in the next few months at the conservation laboratories of the Tuscan Archaeological Superintendency in Florence by experts from the architecture department of the University of Florence. The sandstone, likely from a local source, is heavily abraded and chipped, with one side reddened, possibly from undergoing burning in antiquity. Cleaning will allow scholars to read the inscription. “We know how Etruscan grammar works, what’s a verb, what’s an object, some of the words,” Warden said. “But we hope this will reveal the name of the god or goddess that is worshiped at this site.” The text will be studied and published by a noted expert on the Etruscan language, Rex Wallace, Professor of Classics at the University of Massachusetts Amherst. Archaeologists from the Hebrew University of Jerusalem uncovered in central Israel the earliest known Neolithic quarry in the southern Levant, dating back 11,000 years. Finds from the site indicate large-scale quarrying activities to extract flint and limestone for the purpose of manufacturing working tools. In a research paper published in the journal PLOS One, a team of archeologists, led by Dr. Leore Grosman and Prof. Naama Goren-Inbar from the Institute of Archaeology at the Hebrew University of Jerusalem, showed how inhabitants of the Neolithic communities changed their landscape forever. “Humans became more dominant and influential in their terrestrial landscape and Kaizer Hill quarry provides dramatic evidence to the alteration of the landscape,” said Dr. Grosman. Kaizer Hill quarry is the first of its age, size and scope to be revealed in the southern Levant, where the Neolithic culture is believed to have begun and farming communities have developed. The introduction of farming is widely regarded as one of the biggest changes in human history, and “domestication” of the landscape was a significant process in the changing approach to nature. The quarry is assigned to the Neolithic Pre-Pottery Neolithic A (PPNA) culture, one of the incipient cultural stages in the shift from a hunter-gatherer to a farming way of life. The gradual transition to agricultural subsistence, when people learned how to produce their food rather than acquiring it, was accompanied by a changing attitude to ‘landscape’ and the practices of using the surrounding nature for the benefit of humans. “The economic shift, from hunter-gatherers to agriculture, was accompanied by numerous changes in the social and technological spheres. Various quarrying marks including cup marks showed that the cutting of stones was done in various strategies, including identifying potential flint pockets; creating quarrying fronts on the rocks; removing blocks to allow extraction of flint; creating areas for quarrying dump; and using drilling and chiseling as a primary technique for extracting flint,” said Prof. Goren-Inbar. Researchers suggested a new interpretation to bedrock damage markings on the site of Kaizer Hill quarry, located on a 300 meter-high hill on the outskirts of the sprawling city of Modi’in, some 35 km west of Jerusalem. “At the peak of the hill we found damaged rock surfaces, providing evidence to quarrying activity aimed at extracting flint nodules and exploiting the thick layer of caliche (a sedimentary rock locally known by the Arabic term Nari),” said Dr. Leore Grosman. “The ancient people at the time carved the stone with flint working tools (for example axes). This suggestion differs from the commonly held view, which considers all features defined as cup marks to be devices that were primarily involved in a variety of grinding, food preparation, social or even symbolic activities,” researchers wrote in their paper. NORMAN — Using advanced sequencing technologies, University of Oklahoma anthropologists demonstrate that human DNA can be significantly enriched from dental calculus (calcified dental plaque) enabling the reconstruction of whole mitochondrial genomes for maternal ancestry analysis — an alternative to skeletal remains in ancient DNA investigations of human ancestry. Christina Warinner and Cecil M. Lewis, Jr., professors in the Department of Anthropology, OU College of Arts and Sciences, collaborated with researchers from Arizona State University and Pennsylvania State University on the capture, enrichment and high-throughput sequencing of DNA extracted from six individuals at the 700-year-old Oneota cemetery, Norris Farms #36. “We can now obtain meaningful human, pathogen and dietary DNA from a single sample, which minimizes the amount of ancient material required for analysis,” said Warinner. In recent years, dental calculus has emerged as an unexpected, but valuable, long-term reservoir of ancient DNA from dietary and microbial sources. This study demonstrates that dental calculus is also an important source of ancient human DNA. Very little dental calculus was required for analysis — fewer than 25 milligrams per individual. This makes it possible to obtain high quality genetic ancestry information from very little starting material, an important consideration for archaeological remains. The results of this study provided high-resolution, whole mitochondrial genome information for the Oneota, a Native American archaeological culture that rose to prominence ca. AD 1000-1650, but declined sharply following European contact. “The analysis of mitochondrial DNA allows us to better understand the population history of ancient peoples,” said Anne Stone, professor in the School of Human Evolution and Social Change, Arizona State University. Although dental calculus preserves alongside skeletal remains, it is not actually a human tissue. Dental calculus, also known as tartar, is a calcified form of dental plaque that acquires human DNA and proteins passively, primarily through the saliva and other host secretions. Once mineralized within dental calculus, however, human DNA and proteins can preserve for thousands of years. Dental calculus thus serves as an important non-skeletal reservoir of ancient human DNA.